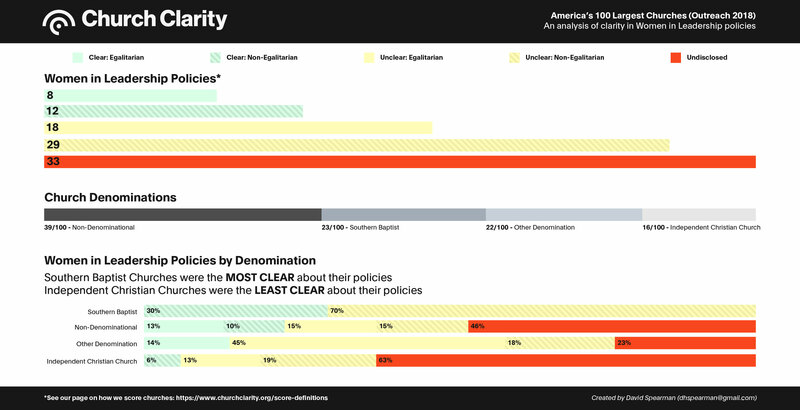 JANUARY 31st, 2019 (New York, NY) - Church Clarity is a crowd-sourced database of churches that scores congregations based on how clearly they communicate their actively enforced policies. The group has released a new study focused on the top largest 100 Churches in America as reported by LifeWay’s publication Outreach Magazine. Each year, Outreach compiles a list of America's Largest Churches and a list of America’s Fastest Growing Churches. These lists are often regarded as a status symbol among the elite group of Evangelical leaders who are featured regularly. Last year, Church Clarity published a study which applied their unique scoring methodology to the churches listed on Outreach’s Top 100. The study highlighted and compared how clearly these churches’ websites communicated their policies which specifically impact LGBTQ individuals. The results of these findings were covered by NBC News, Religion News Service, The Denver Post, The Houston Chronicle and various other outlets. We’re excited to release this year’s report on Outreach’s 2018 Top 100 list with similar insights into LGBTQ policy. Additionally, this year’s study includes the scores for these churches when it comes to how clearly they communicate policies that impact Women in Leadership. A sample from the study is below. To view the entire study visit churchclarity.org/100.